Radon mitigation is a ventilation system that reduces the radon levels in your family’s home. There are a few different ways to do this, but the most common approach is called active soil depressurization (ASD). This means designing and installing a radon reduction system that creates suction under your home. A 5-inch hole is drilled through your basement floor. 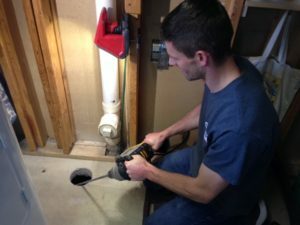 Creating a radon mitigation suction point. 5 to 40 gallons of soil is removed from the hole to create a suction point. A PVC vent pipe is connected to the suction point(s). The vent pipe is then routed either up the outside of your home, or into the house or garage attic. A radon fan is attached to the pipe to create suction under your home. 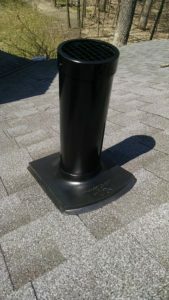 The pipe then extends above your roof to exhaust the radon gas up into the atmosphere. Radon system exhausting above roof. This is a basic overview of how a radon system works. The key to getting your radon levels as low as possible, is to create suction under your entire home. Taking the time to do diagnostic testing is the best way to determine if the mitigation system will achieve that. We will cover diagnostic testing in another blog post. Previous Post: Is Your Radon Fan Working?Next Post: Passive Radon Mitigation System Not Working?